The iTALMEK hydraulic demolition pliers IP series have been designed for primary demolition; cracking concrete-iron structures and debris materials without noises and vibrations. The iTALMEK hydraulic shear is an equipment that joins high productivity and great cutting force with limited weight. 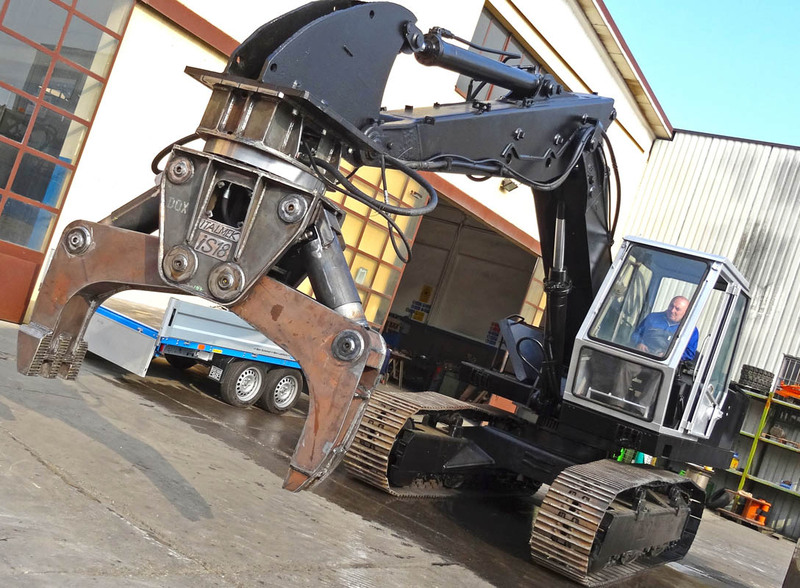 The Italmek IDG range of demolition sorting grabs have been designed primarily for demolishing brick structures as well as and handling/sorting woods and metals. For this purpose the IDG range has been equipped with one oversized central hydraulic cylinder. Ideal for crushing of reinforced concrete, the rotating crusher IF series can be used both for the primary demolition and for the secondary demolition. Equipped with Speed Booster System®, a special acceleration valve, the pulverizers IDF series ensure high productivity in the secondary demolition. The multipurpose pliers IS series is a grab that has been designed following the specific requests of industrial car demolishers. A new product is born, IRC35 allows to break Vignola type rails of all sizes. iTALMEK is specialized in the production of equipments for demolition such as IC series scrap shears, IF series rotating pulverizers, IP series demolition shears, IDF series pulverizers, IDG series demolition sorting grabs and IS series multipurpose grabs. The oneness of iTALMEK items is due to the optimization of weight/power ratio, result of a great number of test and inspections, in order to offer more powerful equipments at the same weight. The weights of equipments in working order go from 200 Kg to 10.000 Kg and can be fitted on machines from 2,0 tons to 100 tons. The structure is exclusively made in steel with the best anti-wear capacity (Hardox®) and high elastic limit (Weldox®) in order to obtain high abrasion resistance and very high mechanical strength, warranty of reliability and extended life of the product.